The inauguration took place in a vast hall equipped with ten manufacturing stations, massive precision machinery, a 200-tonne-capacity air-driven transport cart, a two-storey 600 °C convection oven, and a two-story insulating machine to apply 200 km of fiberglass tape. 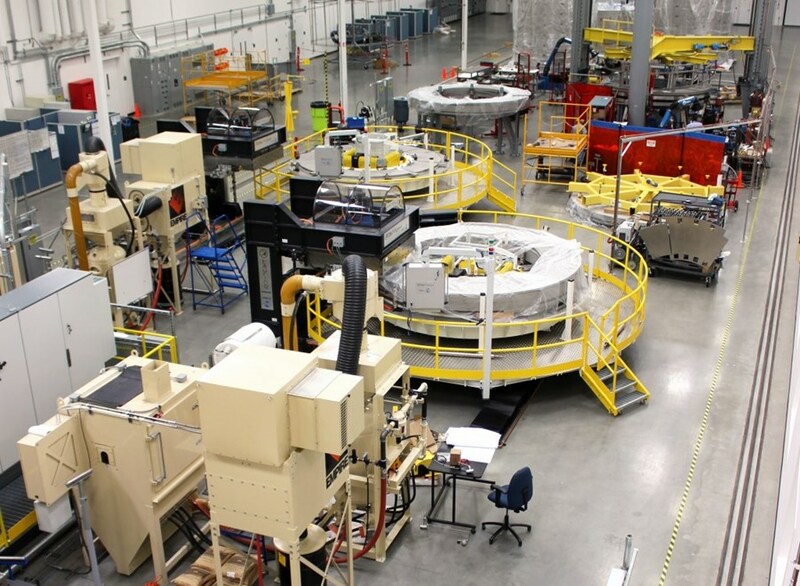 The journalists who covered the launch of central solenoid winding operations at the General Atomics Poway plant in California on Friday, 10 April, had a field day looking for comparisons to convey the sheer power of the 1,000-tonne magnet. Enough energy to lift an aircraft carrier out of the water (The Engineer) ... powerful enough to lift three Washington Monuments (Times of San Diego) ... equivalent to 1,000 cars racing 100 MPH (see press release below). The central solenoid, which forms the backbone of the ITER Tokamak, will be one of the most powerful electromagnets ever built. "The central solenoid represents the heartbeat of ITER, because it pulses the magnets that drive electric current through the Tokamak plasma," said Ned Sauthoff, director of the US ITER Project Office. Standing 18 metres high, with a diameter of 4.13 metres, the central solenoid will be wound from some 42 kilometres of superconducting niobium-tin (Nb3Sn) conductor. "Nothing gives us more confidence, here at the ITER Central Team, than witnessing the progress in the manufacturing of Tokamak components," said ITER Director-General Bernard Bigot in a video address that was broadcast during the inauguration ceremony. The event was hosted by Neal Blue, General Atomics Chairman and CEO, John Parmentola, General Atomics Senior Vice President and John Smith, General Atomics Program Manager Central Solenoid magnet project. 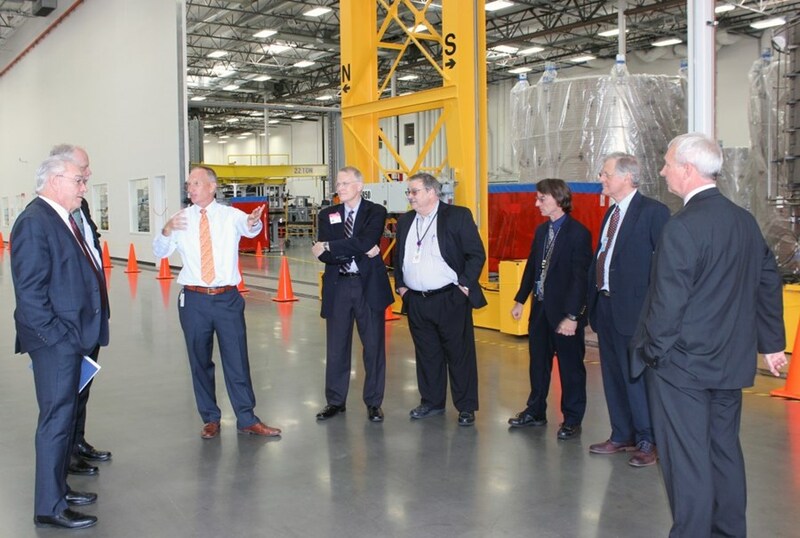 In attendance were US Department of Energy representatives Michael Knotek, Deputy Undersecretary for Science & Energy, and Edmund Synakowski, Associate Director Office of Science, Fusion Energy Sciences; and Ned Sauthoff, US ITER Project Office Director. "The central solenoid is a strong symbol of what the ITER international collaboration is about [...] Japan has provided the conductors; the US will be transforming the conductors into the finished coil; the coil will then be shipped to the ITER site and assembled into the machine ..."
General Atomics expects to be winding conductor for the central solenoid modules until 2017. Due to its size, the central solenoid will delivered to ITER in segments for assembly on site. Delivery is expected in 2019. Click here to view a video produced by the local TV channel KPBS. Read the press release from General Atomics.